An air quality advisory has been issued for Friday due to smoke from the Mendocino Complex fire and other wildfires burning throughout Northern California, according to the Bay Area Air Quality Management District. Melissa Colorado and Jeff Ranieri report. An air quality advisory has been issued for Friday due to smoke from the Mendocino Complex fire and other wildfires burning throughout Northern California, according to the Bay Area Air Quality Management District. Winds are expected to push smoke into the North Bay, and maybe other parts of the Bay Area, and air quality throughout the region could be impacted over the weekend. Anyone who smells smoke from the wildfires is advised by the air district to avoid exposure by staying inside with the windows closed and setting air conditioning systems to re-circulate, rather than allowing smoky air to enter their building or vehicle. Air district officials say smoke can irritate the eyes, airways and sinuses, causing coughing. Anybody with asthma, emphysema or other pre-existing medical conditions could experience wheezing as a result of elevated particulate matter. 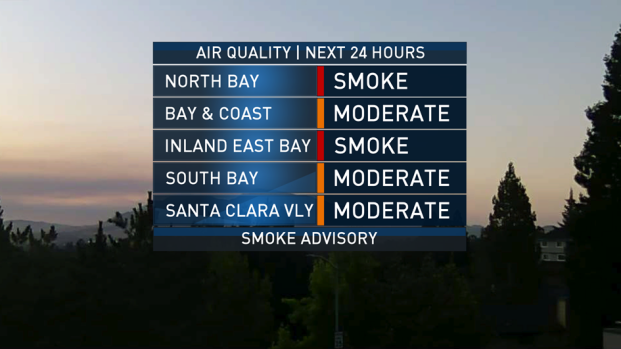 A shift in the winds will bring more smoke into the Bay Area (likely highest in the North Bay and inland East Bay) with hazy skies elsewhere. The Bay Area Air Quality Management District has issued a smoke advisory for the Bay Area Friday. Meteorologist Rob Madeya reports. Children and elderly people are particularly susceptible, according to the air district.